It seems that I have developed a recent theme in my knitting lately that encompasses all things circular. 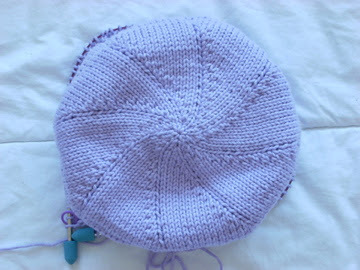 I realized this morning that every project I am currently working on is being knit in the round. 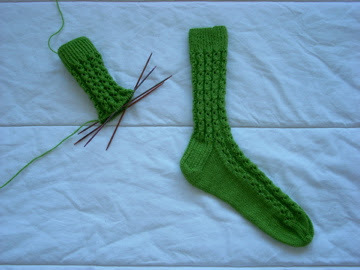 These ugly socks are on their way to completion, although I still have a few distractions preventing me from finishing them. My goal is to be done with them in two weeks. Very easy. Another project, which I haven't shown here yet, is one of the market bags I am making as part of an event at my LYS (see: Oops, I Did It Again!). I knit the bottom of the bag first, based on a circular decrease that I learned while knitting the Mod Beanie from Never Knit Your Man a Sweater*. 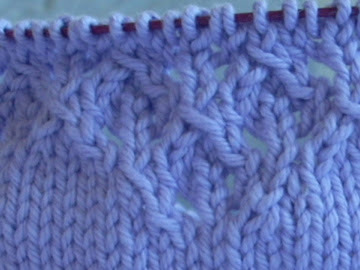 I then picked up stitches all the way around the edge and began knitting up using a modified lace pattern from this top. So far I'm not too happy with the way it looks, but I'm hoping that once I get a little more done and once it's blocked things will look a lot better. If not, well, here's one for the frog pile. 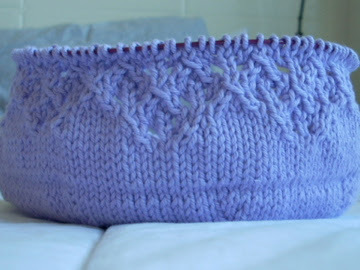 I'm knitting this bag using Rowan Handknit Cotton. It's my first time using cotton yarn and I'm not too excited to continue doing it. After knitting for a while, my finger gets sore from the yarn slipping over it and I don't like the way it doesn't have any stretch. Living in the Midwest finally has its advantage with the fact that wool is almost always an acceptable fiber to knit with. We'll have to wait to see whether or not this project makes it to the finish line. 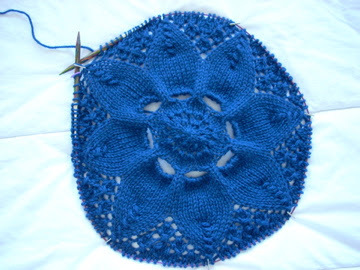 On a much happier note, last night I began knitting the Hemlock Ring Blanket designed by Jared Flood. I'm using Knit Picks Wool of the Andes in Winter Night. I didn't think WOTA was going to be as nice of a yarn as it is. It is much softer than I expected and I think it's going to make a very nice, warm, light blanket. I am definitely going to use this yarn again. As for the pattern, it is so fun! I couldn't stop knitting because every row is something different and it's always so exciting to see what the next one is going to look like. I can tell I'm going to have a lot of fun knitting this blanket. I am also knitting the sleeves on the Duffle Coat using the magic loop. I somewhat wandered from the directions so that I wouldn't have to knit the sleeves flat and then sew the seams. This way the sleeves are knit from the top down and in the round so that I will eliminate much of the finishing that would have been needed. The bag and the blanket look great, Peter! I almost want to knit the blanket now because you make it sound like so much fun. And I can't believe you're already modifying patterns AND doing magic loop! I need to find more time to knit because you're totally eclipsing my mad skills! Hooray for all of your fun new projects! (Also hooray for you almost being done with the one you dislike!) I love the bottom of that bag, spiral patterns like that always get me. The hemlock ring blanket looks fantab too!